Villa Coral Diamond is located in a quiet cul-de-sac and backs onto fields with sea views from the balcony and the raised veranda. The detached villa is set in its own landscape gardens and the walk-in-pool is 9m by 4m large. The pool is surrounded by a large, tiled area, where you can enjoy the days and evenings.The pool area is furnished with 6 sun loungers and a sun umbrella and there is also a small table with chairs. The south-west facing pool area benefits from a beautiful shady pergola by the pool steps, for welcome shade, as the pool area and gardens are in the sun from morning to sunset. There is also a brick built barbecue with a little table and chairs next to it. The villa benefits from free aircon and solar mosquito screens throughout, which let in the breeze but not the insects. The villa is open-plan downstairs with patio doors leading to a raised veranda, which is covered where the large patio table and 6 chairs are placed. The veranda leads onto the pool area, pergola and garden. The kitchen is fully fitted including a large fridge/freezer, hob, oven, washing machine, microwave etc. In the living area is a flat-screen LED TV with DVD player and lots of DVDs in the cabinet. Via the broadband streaming TV box, you can watch BBC, ITV, C4 & 5, as well as Sky News and Sky Sports 1 & 5 and many other Satellite channels, even Sky Atlantic. There is a modern CD /radio/stereo with bluetooth by the coffee table. There is also a downstairs cloak room. The villa has 3 bedrooms, a family bathroom, one en-suite bathroom and a cloakroom (downstairs). Two of the bedrooms have balconies with sea and mountain views. The master bedroom is very spacious and a safe is located in the wardrobe for your use. All bedrooms have large, fitted wardrobes and each bedroom has also a fan in addition to the aircon. The villa is very secure as it is fully enclosed, making it safe especially for children. We live in the UK and we love Cyprus and hope you will enjoy Cyprus as much as we do. We have children/ teenagers and absolutely love to get away to the villa for a relaxing break! We love Coral Bay, as it has the peacefulness you look for on holiday as well as easy access to all the local amenities. There are some beautiful beaches and the great range of bars and restaurants. There really is something for everyone here. 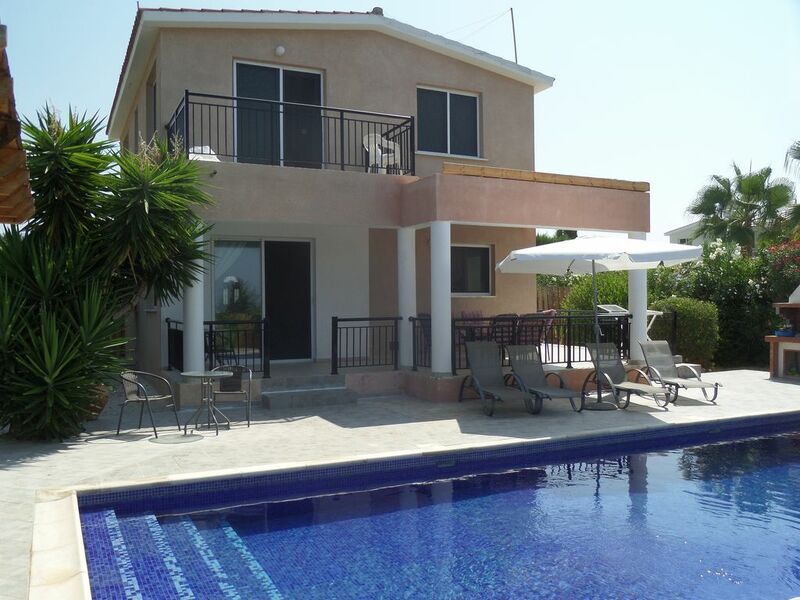 The area is easily accessible with Paphos airport less than an 1/2 hour drive away. Its easy to drive to other parts of the island i.e Latchi where there is a lovely harbour and Polis where you can sit and watch the lovely sunsets. Also Paphos Harbour which is always buzzing with activities. We also love trips to the mountains which are also in easy reach. Our villa is in a great position in a small cul de sac with only 8 houses, brilliant for peace and quiet. The houses are generously set apart and is backed on to a banana plantation so it feels very secluded, but we are close enough to the beach and all the restaurant and night life. Luxury family bathroom with bath. En-suite bathroom to bedroom 1 with shower. All towels and bedlinen are included. Downstairs cloakroom. Outdoor pool shower. towels for bathrooms are provided. Please bring your own pool and beach towels. Spacious lounge and open plan with lovely seating area, 40"LCD TV/Satellite/DVD. Large wooden dining table with sitting for six. Patio doors leading on to sunny veranda and pool area. All windows downstairs are fitted with solar mosquito/fly screens. lots of flower bushes and some palms and palm trees with peach, orange and lemon trees as well as several fig trees. large terraces all around the pool and built in bbq and there is a large pergola by the pool for extra shade. Four golf courses operate on the island: 1. Tsada golf club - the club is situated near Tsada village 30 minutes drive. It is 18 hole golf course. 2. Secret Valley golf club - it is located 18km east of Paphos. 3. Aphrodite Hills - an 18-hole international golf course located near the birthplace of Aphrodite, 40 min drive, also available is 3 hole course. 4. Elea Golf Club newly opened end of 2010, only a 10min drive from centre of Paphos, on the Airport road. There is also a driving range located on the main road between Coral Bay and Paphos. Very lovely Villa, well equiped. A superb Villa containing everything you would ever need. It was a great two weeks with temperatures of 35c every day. The Villa is situated in a lovely area and is a perfect place to stay. We really enjoyed it. Would fully recommend this property. We stayed for a week with our teenage children and the location was perfect. We hired a car but public transport appeared to be very good and regular, with the beach walking distance. The pool is fantastic - a great size and so refreshing at the end of a long day. Cleanliness of the property was excellent and it had all the mod-cons we needed. Communication with the owners was very quick and helpful. Thank you so much for your kind words. We are always very happy when our guests enjoy the villa and their holiday, so we are pleased you had a lovely time. We hope to welcome you back anytime. Overall, a fantastic holiday experience. The owners were very friendly and replied to emails and queries in a timely manner. Before arrival, we received detailed information on how to locate the villa from the local airport. On arrival, the villa was very clean and in excellent condition, as well as being very well supplied with food storage and cooking equipment. The rooms were all a great size. The pool was very clean and perfect size. Lots of information was provided on local restaurants, ammenities and activities. The villa is excellently located within easy walking distance of the beach and also to coral bay centre, but not so close as to be bothered by noise at night. We were also able to tune in to English TV channels with ease, should we want to. All in all, I dont have a single bad word to say about the villa, and am very much looking forward to staying again in the future! We are very happy that you enjoyed the villa and pool and had a lovely holiday - so much so that you are planning another holiday there. Thank you so much and we look forward to welcoming you back! It’s a lovely villa with luxury pool. A quite and peaceful location. Short walk to beach and restaurants and supermarket We took my husbands parents with us and they said it was one their best holiday they’ve had and best part being sitting by the pool and enjoying the ambiance! Looking forward to going there again next year. We are very glad that you enjoyed the villa and the pool and that it helped your father in law to recharge and relax. Thank you so much for looking after the villa and we would love to welcome you back anytime. Main beach of Coral Bay is a blue flag sandy beach and is only a short 10 min walk, you will find lots of water sports, sun beds and umbrella's for a small charge, cafe and restaurant. A little bit closer along the coast is the Corallia beach, which is really nice and safe for children, there are several little coves both ways along the coast. If you like walking you can walk along most of the coast towards Paphos or the Akamas. There is a regular bus service from Coral Bay to Paphos Harbour. Paphos International Airport is about 23km and is the nearest airport ,about half an hour drive from the villa; there is also a bus service from the airport. Plenty of car hire firms are based at the airport. Paphos town centre is 15 mins drive from Coral Bay, as is the lovely harbour, where you can sit and relax and watch the world go by. Car hire is not essential, but if you want to visit other parts of the island then it is recommended. The villa is directly in Coral Bay Village, its' restaurants are easily reached by walking, as are two beaches. Paphos town and places of interest are all just a short distance away, either by car or by bus. The bus stop is a short walk away. Horse riding is also only a short drive away and Go Karting is a short walk away. There is a regular bus service from Coral Bay to Paphos Harbour. Coral Bay has everything you will need from restaurants, local shops, fruit markets, bakery, supermarkets, pharmacy, banks and much more, the village of Peyia is close by with also a good selection of shops, bars, banks, and plenty of high quality restaurants (Italian, Mexican, Cypriot, Japanese, Fish and Chip, Chinese) and bars. Pafos town, the famous mosaics, The King's tombs and the picturesque harbour are only 20 minutes driving distance away. Also the well known fishing harbour of Latchi, the mythical baths of Aphrodite and the Polis town are 30 minutes driving distance away. Air-con/WiFi in all rooms with no additional cost. Check in from 14:30 and the villa must be vacated by 11:00. Whenever flight times are awkward we will do our best to assist in any way possible. Changeover Day: The changeover day is flexible. Notes on prices: Prices are for the property per week in Pounds.